Mr. Smith, who has appeared as counsel of record in over 900 civil cases in the U.S. District Court for the Eastern District of Texas, served as chairman of the Eastern District’s Local Rules Advisory Committee from 2000-2009. He has also been the editor of the O’Connor’s Federal Rules * Civil Trials handbook on federal civil procedure since 1998. Mr. Smith is a frequent author and speaker on topics including intellectual property, patent, and product liability litigation, federal court practice, ethics, and law office administration. Mr. Smith holds a law degree from Baylor University, a master’s degree in public administration from the LBJ School of Public Affairs at the University of Texas at Austin, and a bachelor’s degree from East Texas State University (now Texas A&M University-Commerce). Mr. Smith is a Sustaining Life Fellow of the Texas Bar Foundation. He also served on the Board of Directors of the State Bar of Texas from 2005-08, representing the 24 counties of State Bar district 1 in northeast Texas, where he was recognized as Outstanding Third Year Director and received a Presidential Citation for his work in the area of member benefits. He is a past chair of the editorial board for the Texas Bar Journal, and of the Council of the Litigation Section of the State Bar of Texas, and currently serves as the president of the East Texas chapter of the American Board of Trial Advocates (ABOTA). 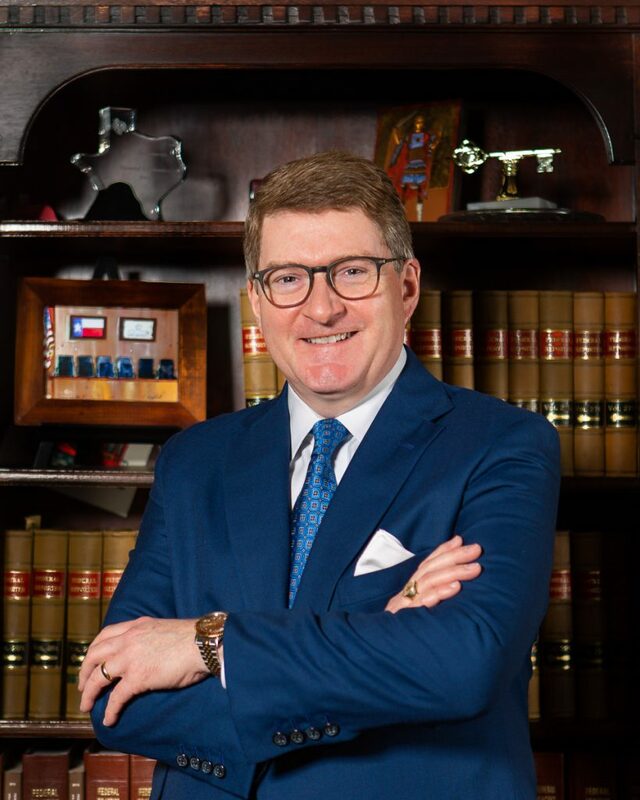 He is a past president of the Eastern District of Texas Bar Association, East Texas Trial Lawyers Association, and the Harrison County Bar Association, and is a charter member of the T. John Ward American Inn of Court. He has also been selected for inclusion in the 2008-2018 Texas Super Lawyers lists, and is a recipient of the Texas Access to Justice Foundation’s Cy Pres: Impact on Justice award, as well as the Northeast Texas Association of Paralegals’ Attorney Most Supportive of Paralegals award, and the Standing Ovation award from TexasBarCLE. In 2013, Texas Lawyer named him one of five “Top Notch” lawyers in intellectual property law in Texas. Before entering private practice, Mr. Smith was a law clerk for the late U.S. District Judge Sam B. Hall, Jr. of the Eastern District of Texas, Marshall and Texarkana Divisions, and worked in Baylor University’s Office of General Counsel. Prior to attending law school, Mr. Smith worked for the National Commission to Prevent Infant Mortality in Washington, D.C., and the Texas General Land Office and the Texas Education Agency in Austin, Texas. Mr. Smith, a Marshall native, has also been active in community affairs. He served on the Marshall City Commission for three terms, from 1996-2002, and is a former president of the Harrison County Historical Museum and the Citizens Advisory Committee and member of the Marshall Chamber of Commerce Board of Directors. Mr. Smith is married to Harrison County Treasurer Jamie Marie Noland, and they have three sons, Grayson, 19 and twins Collin & Parker, 16. In addition to his legal writings, Mr. Smith is also the author of two books on aircraft carriers, Essex Class Carriers in action, and US Light Carriers in action, and is the sole inventor on two U.S. patents.